Image via We Love GMOs and Vaccines. Few technologies have been demonized to the same extent as genetic engineering. According to countless websites, GMOs are an evil scourge on the earth that destroy biodiversity, use exorbitant levels of pesticides, and hybridize rampantly with wild crops, and all of that is before we even get to the (largely false) claims about Monsanto. Reality, however, shows a rather different picture, especially when it comes to Bt GMOs, which are what I want to focus on for this post. You see, one of the problems with GMO debates is that people on both sides tend to lump all GMOs together, but there are actually lots of different types of GMOs with different properties and different pros and cons. Of these different types, Bt GMOs are arguably one of the best, and as I will show, they actually reduce pesticide use, increase crop yields (thus reducing land use), increase profits for farmers, and are safer for the environment than their conventional counterparts (including organic farming). Further, they actually benefit farmers who don’t grow GMOs by providing a protective “halo” around their farms that protect them from insect pests. As a result, non-GMO farms that are near Bt GMO farms actually use less pesticides and enjoy higher profits than they would without the GMO farms. Note: Most Bt GMOs are not herbicide resistant (i.e., aren’t designed for use with glyphosate [aka roundup]), so if your issue with GMOs is that you don’t like glyphosate, you should be fine with many Bt GMO crops (also you should read the actual scientific literature on glyphosate). Before we can talk about the benefits of Bt GMOs, we need to talk about the alternatives and history of Bt. Bt toxin is actually a crystalline protein produced by the bacteria Bacillus thuringiensis, and decades ago, scientists discovered that it was a very effective pesticide against certain groups of insects, while being safe for most other organisms. There are three reasons for this. First, the acidic stomachs of mammals (and many other animals) breaks the protein down. Second, only part of the protein is potentially dangerous, and it has to be broken down in a highly alkaline environment (which is present in insect guts, but not most animals) to release the potentially dangerous part. Third, it operates by binding to specific receptors that are found on certain insect guts, but not the guts of other animals. Thus, its mode of action simply doesn’t work on humans and most other animals (for more details about mode of action, see Kumar and Chandra 2008 and this page from Harvard). As a result, it is safe for humans and most animals at anything but an extremely high dose (Mendelsohn et al. 2003; remember, even water is fatally toxic at a high dose [Garigan and Ristedt 1999]). All of these properties make Bt toxin an ideal pesticide, and it was widely adopted, particularly for organic farming (yes, organic farming uses pesticides as well, just not “synthetic” pesticides). As far as pesticides go, it is a pretty safe one, but it is still not without problems. First, the spraying process takes time and money, uses water, burns fossil fuels, has to be done multiple times a year, etc. Additionally, when it is sprayed on crops, it kills a wide range of insects that were on the crops, not just the ones that actually eat the crops. Further, spraying has to be timed correctly, it doesn’t provide continuous protection, etc. Also, it is far from the only insecticide being used, and many are far worse for the environment. This is where GMOs come in. Clever scientists figured out a way to genetically engineer plants to produce Bt toxin themselves. As a result, minimal spraying is needed, because the plant produces its own pesticide (keep in mind, this pesticide is very safe for humans). This saves farmers time and money, provides continuous protection (resulting in higher crop yields), and has fewer effects on non-target species. I’ll elaborate on all of these points below. Note 1: Pesticides are simply chemicals used to kill pest species. Insecticides, herbicides, fungicides, etc. are all types of pesticides that target specific groups (insects, plants, and fungi, respectively). I sometimes hear those who oppose GMOs claim that GMOs haven’t delivered on their promises, but when it comes to Bt GMOs, that is demonstrably false. Numerous studies have consistently confirmed that Bt GMOs greatly reduce pest populations, which results in less damage to the crops (Hutchison et al. 2010; Lu and Desneux 2012; Dively et al. 2018). Further, all of this is accomplished while using less pesticides (Shelton et al. 2002; Cattaneo 2006; Lu and Desneux 2012). This, of course, also translates to higher yields and higher profits for farmers (Shelton et al. 2002; Cattaneo 2006; Vitale et al. 2010). Indeed, one study estimated that over a 14 year period, Bt maize (aka corn) saved farmers in Illinois, Minnesota, and Wisconsin $3.2 billion, and saved farmers in Iowa and Nebraska $3.6 billion (Hutchison et al. 2010). So, don’t believe the anti-GMO horror story that GMOs are somehow bad for farmers. They aren’t. Farmers choose to use them because they benefit the farmers. Note: The studies cited in this post came from a wide range of countries, not just developing countries. Australia, the USA, China, European countries, and African countries are all represented in the studies I cited throughout. As explained in the previous section, Bt GMOs use significantly less pesticides than their conventional/organic counterparts. That reduction stems from the fact that non-GMO crops are frequently sprayed with insecticides; whereas the Bt GMOs produce their own insecticides, which greatly reduces the need for spraying pesticides. So, if your biggest concern with GMOs is that they use too many pesticides, then you should support Bt GMOs, because they use substantially less than other agriculture methods (including organic). Because of the targeted nature of GMOs, this reduction in pesticide use translates directly to improved biodiversity, while still effectively killing pests. When a field is sprayed with an insecticide (even a fairly safe one like the Bt spray used in organic farming), a large range of insects in the field are affected, even if they aren’t pest species. In other words, things like bees and monarch butterflies (particularly their caterpillars) can be killed by the pesticide, even though they aren’t pest species and don’t eat the crops (depending on the pesticide, there can also be negative effects for other wildlife, aquatic ecosystems, etc). This is inevitable collateral damage from spraying pesticides. The Bt GMOs, however, are very targeted. Insects need to actually eat the plant to get the toxin. As a result, innocent, non-pest species that just happen to be in the field are largely unaffected. Plus, there are no pesticides running into waterways and the other negative effects of pesticides are eliminated. To be clear, this isn’t speculative, dozens of studies have confirmed this. Indeed, several meta-analyses of the literature have found that Bt GMOs do not adversely affect non-target species, and, compared to crops that are sprayed with Bt, they have significantly better insect diversity (Marvier et al. 2007; Wolfenbarger et al. 2008; Comas et al. 2014). Additionally, one study found that by reducing the use of pesticides, Bt GMOs actually increased populations of insect predators, such as birds (Lu and Desneux 2012). So, if your concern with GMOs is biodiversity, then, once again, you should be supporting Bt GMOs, because they are demonstrably better than the alternatives. Having said that, there are reports of some non-target insects being affected by Bt GMOs, but these are usually insects that specialize on eating or parasitising pest species (Wolfenbarger et al. 2008). So, in many cases, it’s not that the GMO itself harms them, but rather that the GMO kills their prey. Also, to be 100% clear, studies comparing Bt GMOs to conventional crops that are not sprayed at all have found that there is a slight difference in diversity levels (likely at least partially from the type of ecological interactions I just described; Whitehouse et al. 2005), but the expectation that most crops shouldn’t be sprayed at all is unrealistic (it is a nirvana fallacy) and would result in other environmental problems (e.g., increased land area, tilling methods that damage the soil, etc.). 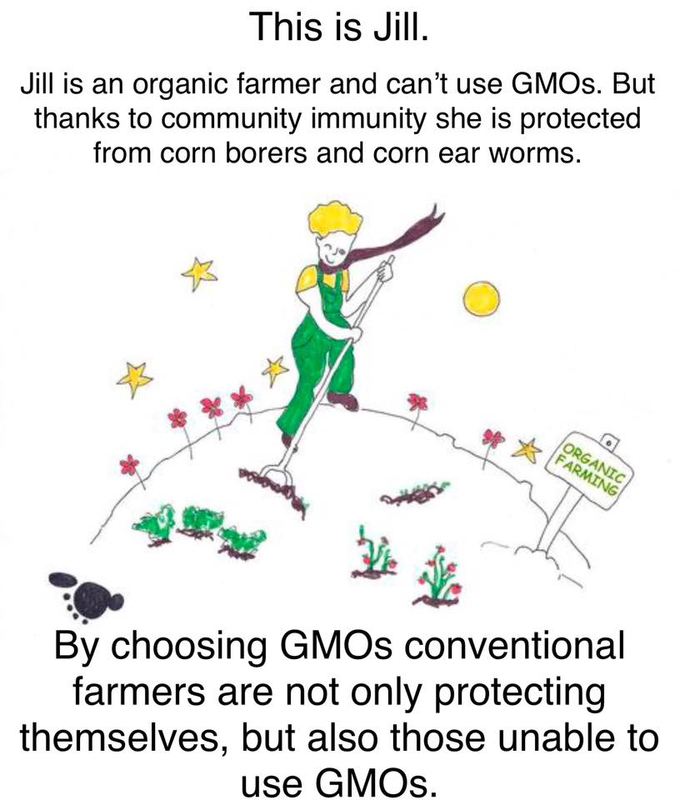 It’s also worth explicitly stating that the safety of Bt GMOs still holds true even if we look at specific groups that people care greatly about, like bees and butterflies. There was initial concern that the pollen from Bt crops could adversely affect these groups, but that suggestion was based on unrealistic exposure levels, it ignored the fact that they are affected by sprays, and subsequent studies have failed to find evidence that these crops harm bees (Duan et al. 2008) and non-pest butterflies (Mendelsohn et al. 2003). Further, Bt GMOs have one final benefit: reduced habitat loss. Habitat loss and fragmentation is the single biggest threat to biodiversity (Newbold et al. 2015; Wilson et al. 2016; Young et al. 2016). Further, conversion of natural lands to agriculture is the biggest cause of habitat loss (Foley et al. 2005; Phalan et al. 2016) and is well known to be a serious threat to conservation (Martinuzzi et al. 2015; Tilman et al. 2017). This is one of the key reasons why, as a conservation biologist, I support GMOs. They have a higher yield than conventional crops, which means that they need less land to grow the same amount of food. Therefore, from an environmental standpoint, they are tremendously beneficial. Indeed, increasing crop yields is often argued as a key strategy for preserving biodiversity (Phalan et al. 2016; Tilman et al. 2017). Let me try to explain it this way. All agriculture is bad for biodiversity. When you take a natural forest or grassland, clear it, and plant crops, you will inevitably lose a large number of species that used to live there. People often seem to have this idyllic view of farms (particularly organic farms) as if all the animals and plants that lived in the forest before it was cleared will somehow continue to live in the organic farm field. This is a fairy tale. Even if you rotate your crops, never till the soil, and never use any pesticides, the biodiversity of that farm field will still be substantially lower than what it was before you turned it into a farm field, because the field doesn’t contain the various habitat types that many animals need (e.g., a forest species is not going to live in a field). People seem to have no trouble realizing this when it comes to things like clearing rainforests to grow palm oil, but for some reason, when it comes to crops in countries like the USA and European countries, people suddenly don’t seem to realize how harmful clearing land for agriculture actually is, but its negative effects on biodiversity are well-documented (Krauss et al. 2010; Martinuzzi et al. 2015). If you listen to the anti-GMO crowd, they often operate under the pretense of protecting farmers who don’t grow GMOs, but as usual, reality is quite different. Indeed, several studies have confirmed that non-GMO farmers benefit tremendously from having Bt GMO farms near them. This is the case because the Bt GMO farms protect the non-GMO farms via what has been called the “halo effect.” You see, the Bt GMOs do such a good job of killing pest species, that the populations for those species decline in the areas where Bt GMOs are grown (Carrière 2003; Wu et al. 2008; Dively et al. 2018). Additionally, as mentioned earlier, Bt GMOs result in increased populations of generalist predators (such as birds) compared to non-GMO crops, and these predators act as biological control agents on the fields in their area (Lu and Desneux 2012). As a result of both of these factors, in the areas around Bt GMO farms, there are fewer pest insects to attack the non-GMO crops, and non-GMO farmers enjoy less crop damage, higher yields, and higher profits than they would if there were no GMO farms around (Hutchison et al. 2010; Wan et al. 2012; Dively et al. 2018). Remember that study that I mentioned earlier that found that Bt corn saved farmers billions of dollars? In Illinois, Minnesota, and Wisconsin $2.4 billion of those savings were by non-GMO farmers, and in Iowa and Nebraska $1.9 billion were by non-GMO farmers. Further, this protective halo effect allows non-GMO farmers to use fewer pesticide applications than they would need to otherwise (Wu et al. 2008; Hutchison et al. 2010; Dively et al. 2018). So, both the environmental and economic benefits of Bt GMOs spill over into the non-GMO farms. In addition to the benefits to the environment and farmers, Bt GMOs have also been demonstrated to be safer for humans because of reduced mycotoxins (Pellegrino et al. 2018). These are chemicals produced by fungi, and can end up in our food when fungi are growing on the crops. The Bt crops don’t actually kill the fungi, but they do kill the pest-insects that make habitats for the fungi. You see, the fungi like to grow in the holes created by pest insects chewing on the plants. So, fewer pest insects means fewer holes, which means less fungi and less mycotoxins (Pellegrino et al. 2018). I don’t want to oversell this, because, at least in first world countries, food is usually checked for mycotoxin contamination, so food with it usually gets thrown out. Nevertheless, the filtering process is not 100% effective, and they are still a concern. So, the Bt GMOs do in fact reduce your risk of this. At this point, people usually bring up pesticide resistance. This is the evolved resistance to Bt toxin that ultimately causes Bt to be ineffective at controlling insect populations (it is analogous to antibiotic resistance). This certainly is a problem, but it is not a problem that is limited to GMOs. Indeed, insects were documented evolving resistance to Bt long before GMOs were available (remember, Bt is used as a spray in many non-GMO farms, including organic farms; McGaughey 1985; Tabashnik et al. 1990). So even if all the Bt GMO fields were replaced with organic fields (as some would like to see happen) we would still be having this problem because resistance to a widely used pesticide is an inevitable outcome of natural selection (at least inevitable without careful management). Third, although resistance is a problem, it is not an insurmountable one. One current strategy that is widely used is to have “refuge’ fields that are not Bt GMOs and are not treated with Bt (Siegfried and Hellmich 2012). Indeed, in the USA, the EPA requires farmers who use Bt corn to have at least 20% of their fields as refuge fields. This is a good strategy because of how natural selection works. I don’t want to get too bogged down in the details here, but in short, Bt GMOs (or Bt sprays) kill the majority of pest insects in the field, and only a handful that have alleles that are resistant to Bt will survive. If those insects mate with each other, we will quickly get a resistant population where all the insects have resistant alleles. By having a nearby refuge, however, we have a large population that is not resistant, making it more likely that the resistant insects will mate with the non-resistant insects, and the alleles for being resistant will be diluted. Indeed, it is well known that gene flow can swamp adaptation in this way (Kawecki and Ebert 2004; Foster et al. 2007; Funk et al. 2012; read this series for more about how evolutionary mechanisms work). Other strategies are also being developed and tested, so this is very much a situation where we should take the necessary precautions to prevent insect resistant, but there is no reason to use insect resistance as a general argument against the crops. As the old saying goes, don’t throw the baby out with the bathwater. In short, Bt GMOs have tremendous benefits and are actually the opposite of most anti-GMO claims. For example, GMO opponents claim that GMOs increase pesticide use, but Bt GMOs greatly reduce it. Similarly, you may have heard the claim that GMOs are bad for biodiversity, but Bt GMOs are actually far better for it than non-GMO crops (including organic crops) because they are more targeted and have fewer effects on non-target species. Further, habitat loss is the dominant threat to biodiversity, but because Bt GMOs increase yields, they reduce the need for clearing habitat for agriculture. Additionally, they benefit farmers by increasing yields and profits, and they even benefit non-GMO farmers by providing a protective “halo” that increases the non-GMO farmers’ yields and profits and reduces their need for pesticides. So, from both an environmental and economic standpoint, Bt GMOs are better than the conventional and organic alternatives. Carrière 2003. Long-term regional suppression of pink bollworm by Bacillus thuringiensis cotton. Proceedings of the Royal Academy of Sciences 100:1519–1523. Cattaneo 2006. Farm-scale evaluation of the impacts of transgenic cotton on biodiversity, pesticide use, and yield. Proceedings of the Royal Academy of Sciences 103:7571–7576. Duan et al. 2008. A meta-analysis of effects of Bt crops on honey bees (Hymenoptera: Apidae). PLoS ONE 3:e1415. Foley et al. 2005. Global consequences of land use. Science 309:570–574. Foster et al. 2007. Genetic structure and evolved malaria resistance in Hawaiian honeycreepers. Molecular Ecology 16:4738–4746. Funk et al. 2012. Harnessing genomics for delineating conservation units. Trends in Ecology and Evolution 27:489–496. Garigan and Ristedt 1999. Death from hyponatremia as a result of acute water intoxication in an Army basic trainee. Military Medicine 164:234–238. Hutchison et al. 2010. Areawide suppression of European corn borer with Bt maize reaps savings to non-Bt maize growers. Science 330:222–225. Kawecki and Ebert 2004. Conceptual issues in local adaptation. Ecology Letters 7:1225–1241. Krauss et al. 2010. Habitat fragmentation causes immediate and time‐delayed biodiversity loss at different trophic levels. Ecological Letters 13:597–605. Kumar and Chandra 2008. Bacillus thuringiensis (Bt) transgenic crop: An environment friendly insect-pest management strategy. Journal of Environmental Biology 29:641–653. Lu and Desneux 2012. Widespread adoption of Bt cotton and insecticide decrease promotes biocontrol services. Nature 487:362–365. Martinuzzi et al. 2015. Future land-use scenarios and the loss of wildlife habitats in the southeastern United States. Ecological Applications 25:160–171. Marvier et al. 2007. A meta-analysis of effects of Bt cotton and maize on nontarget invertebrates. Science 316:1475–1477. McGaughey 1985. Insect resistance to the biological insecticide Bacillus thuringiensis. Science 229:193–195. Mendelsohn et al. 2003. Are Bt crops safe? Nature Biotechnology 21:1003–1009. Newbold et al. 2015. Global effects of land use on local terrestrial biodiversity. Nature 520:45–50. Pellegrino et al. 2018. Impact of genetically engineered maize on agronomic, environmental and toxicological traits: a meta-analysis of 21 years of field data. Scientific Reports 8. Phalan et al. 2016. How can higher-yield farming help to spare nature? Science 351:450–451. Shelton et al. 2002. Economic, ecological, food safety, and social consequences of the deployment of Bt transgenic plants. Annual Review of Entomology 47:845–881. Siegfried and Hellmich 2012. Understanding successful resistance management: The European corn borer and Bt corn in the United States. GM Crops and Food 3:184–193. Tabashnik et al. 1990. Field development of resistance to Bacillus thuringiensis in diamondback moth (Lepidoptera: Plutellidae). Journal of Economic Entomology 83:1671–1676. Tilman et al. 2017. Future threats to biodiversity and pathways to their prevention. Nature 546:73–81. Vitale et al. 2010. The commercial application of GMO crops in Africa: Burkina Faso’s decade of experience with Bt cotton. AgBioForum 13:320–332. Wan et al. 2012. The halo effect: Suppression of pink bollowrn on non-Bt cotton by Bt cotton in China. Whitehouse et al. 2005. A comparison of Arthropod communities in transgenic Bt and conventional cotton in Australia. Environmental Entomology 34:1224–1241. Wilson et al. 2016. Habitat fragmentation and biodiversity conservation: key findings and future challenges. Landscape Ecology 31:219–227. Wolfenbarger et al. 2008. Bt Crop effects on functional guilds of non-target arthropods: a meta-analysis. PLoS ONE 3:e2118. Wu et al. 2008. Suppression of cotton bollworm in multiple crops in China in areas with Bt toxin-containing cotton. Science 321:1676–1678. Young et al. 2016. Patterns, causes, and consequences of Anthropocene defaunation. Annual Review of Ecology, Evolution, and Systematics 47:333–358. This entry was posted in GMO and tagged appeal to nature fallacies, Bad arguments, GMOs, Safety. Bookmark the permalink. There’s one “valid” criticism based on things you cite. If you consider the consolidation of farms, such that they become a smaller number of farms that get larger and larger over time, a problem you might consider GE crops to be harmful. GE technologies certainly can and do make farming more efficient and thus could be seen as contributing to this effect (from a global perspective, a counterargument to this might be various studies showing how small landholder farms in developing countries can benefit, proportionately, even more than is the case for the farmers in developing countries: what in the developed world becomes a tool to scrape slightly more profit can become, in the developing world, the difference between subsistence living and being able to make enough of a profit to send one’s children to school). The problem with this view, however, is that singling out genetic engineering as the one uniquely disruptive technology that somehow crosses the line and makes farming too efficient to be fair for all seems like an arbitrary and very peculiar choice. Why not hybrids? Why not tractors and combine harvesters? Why not fertilizers? Nothing about genetic engineering makes it a greater contributor to this sort of economic disruption than anything else. All of the economic trends we see in farming today predate the introduction of GE traits into the marketplace (there is no particular “farm crisis” dating to the early 1990s). If anything, the introduction of GE traits is a lesser contributor than, for instance, mechanization; since a very large farmer benefits more than a smaller farmer from biotech traits only proportionally to their size; whereas a very large farmer benefits more than a smaller farmer from buying more efficient farm equipment more than proportionally to their size (a proper modern Luddite critique of this would thus have to be rather old fashioned and address the machines, just like the Luddites of old did, rather than breeding technologies). There is also a criticism of this criticism which could be seen as valid or which could be seen as a reductio ad absurdum which is that such a criticism might be linked to a profoundly regressive idea that small, peasant run, subsistence farms are always best (some GE critics, such as Vandana Shiva, definitely seem to hold this idea —but it’s would be unfair to suggest that most do). It is a promotion of a sort of romantic, idyllic ideal which ignores the realities of subsistence farming and de facto glorifies poverty and the very set of conditions that millions around the world seek to escape. Additionally, there’s the fact that we do need to grow a lot more food in the foreseeable future and that, as you point out, it is desirable, for conservation reasons, to do so in an area that is as small as is reasonably achievable. 1· Because as larger farms become more efficient over time and acquire more land, smaller farms that have not been able to catch up become non-profitable and go out of business —turning into an endless treadmill such that diminishing margins require greater efficiency which requires greater size which, macroeconomically, further reduces margins,… etc..
That argument about small farms is a variant of the “Noble Savage” ideology.